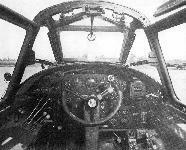 Boston III (AL296) of No 107 Squadron, RAF, 1942. Boston IIIA (BZ357) of No 88 (Hong Kong) Squadron, 1944. Havoc I (BD112) of No 23 Squadron, RAF, 1941. Boston III (A28-15) of No 22 Squadron, RAAF. An ex-Belgian-contract Douglas DB-7, used by the RAF as a Boston I, distinguished by the short nacelles for the Twin Wasp engines. 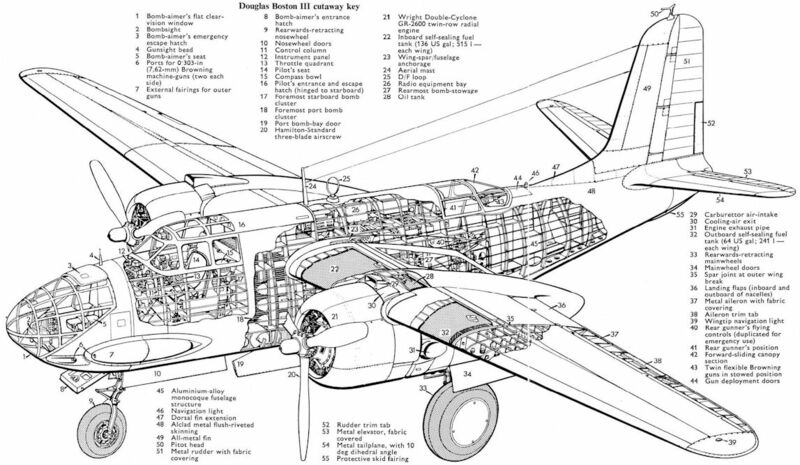 The Douglas Boston III Medium Bomber (two Wright R-2600-A5BO engines). A Havoc II after conversion in Britain to have a 12-gun nose and early AI equipment with aerials on the nose and wing. The cockpit of a US AAF Douglas A-20G-15, showing the gun sight and gun firing button (on the control wheel) for the forward firing guns.